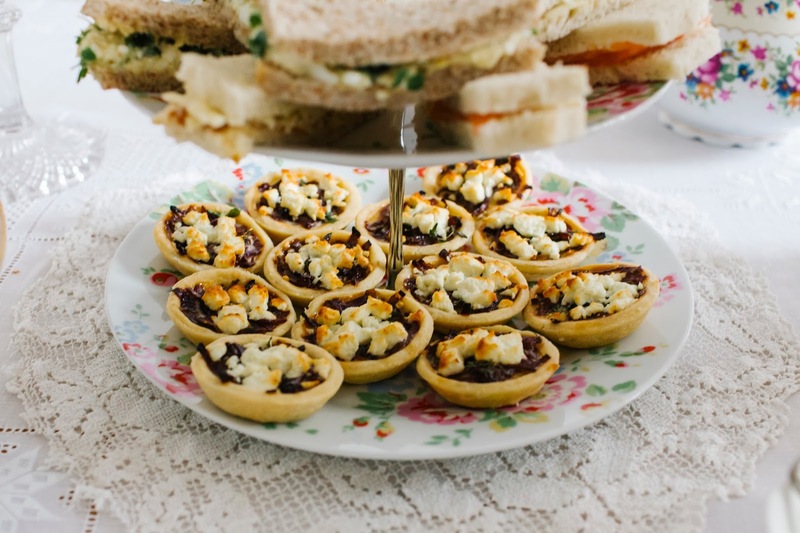 I often make these delicious little tartlets for my vintage tea parties. They look pretty, they’re full of flavour and are dainty enough to be served alongside finger sandwiches. Cooked slowly with a little brown sugar and some balsamic vinegar, the red onions take on a lovely caramelised flavour as they soften. I usually make these as a gluten free option, swapping the plain flour for some Doves Farm gluten free plain white flour. I find that it is best to leave this pastry to chill a while longer in the fridge though, maybe for an hour or so, before rolling out. You will need two 12 hole fairy cake or mini muffin tins for this recipe, and a round cutter a little bigger than the holes in your tins. 1. Slice the red onions into thin slivers and fry in the olive oil on a very low heat for 20 minutes. Add the balsamic vinegar and sugar to the onions and fry gently for another 10-15 minutes, until soft and caramelised. At this point taste the onions and add a little more sugar or balsamic vinegar if required. Leave to cool. 2. If making the pastry by hand, sift the flour into a large bowl and add the butter. Rub the butter into the flour using your fingertips. When you reach the consistency of coarse breadcrumbs, add the beaten egg and water and mix with a fork or rounded knife. Bring the last of the mixture together by hand, taking care not to over handle. The pastry can also be made in a food processor by mixing the flour and butter together until you reach the breadcrumb stage (the pulse setting works well for this), then adding the egg and water and mixing until the mixture just begins to form a ball. Take care not to over mix. Shape the pastry into a disc, cover in cling film and leave to rest in the fridge for 20 minutes. 3. Remove your pastry from the fridge and roll out a little thinner than a £1 coin. If possible, roll the pastry between two sheets of greaseproof paper, to avoid adding extra flour. Otherwise, roll on to a floured surface. Cut 24 rounds from the pastry and line your tins with them, pressing down gently. Place the tins into the fridge for another 20 minutes. 4. Preheat oven to 190°C/170°C fan/gas 5. 5. Place a spoonful of cooled onions into each pastry case, taking care not to over fill. There may be onions left over (great with sausages!). Divide the egg and milk mixture between the 24 tarts, ensuring that it does not reach the top edge of the pastry case. 6. Bake for 15 minutes, then remove from the oven and add crumbled feta and some fresh thyme to the top of each tart. Return to the oven and bake for approximately 5-7 minutes, or until the pastry and feta are starting to brown. 7. Allow to cool a little before removing carefully from the tins. These tartlets can be served warm or cold. 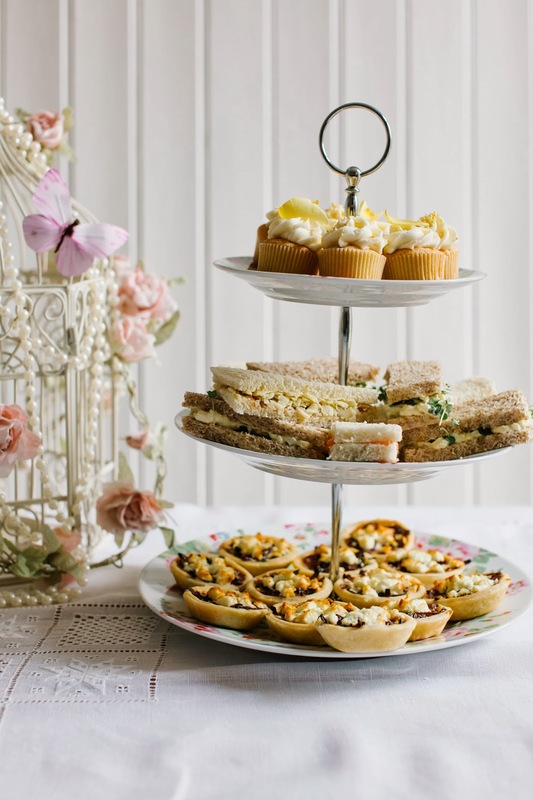 A perfect savoury for an afternoon tea. Thanks Phil. They would probably be good with brie or goat's cheese too.